Today, during the Autodesk University keynote address, Autodesk announced am exciting and significant change to the Product Design Suite offering. From as early as January 2015, active Product Design Suite customers will gain access to the world’s leading CAD product built on ‘Cloud’ technology, Autodesk Fusion 360…. The question is, is this really a good thing for Inventor and it’s users? Let’s start with what Autodesk have to say and a few snippets from the FAQ. This announcement and corresponding entitlement further demonstrates their commitment to adding value for both Maintenance and Desktop Subscription customers. Product Design Suite provides access to the latest engineering and design solutions in one suite of tools. Fusion 360 allows users to explore more ideas, work together in a collaborative cloud-based design, engineering and fabrication environment, with access to their data anytime from any device. With Product Design Suite containing Fusion 360, customers will have access to the best desktop and cloud based tools to transform their product development process with more options and flexibility than ever before. What specifically will Product Design Suite subscribers get? 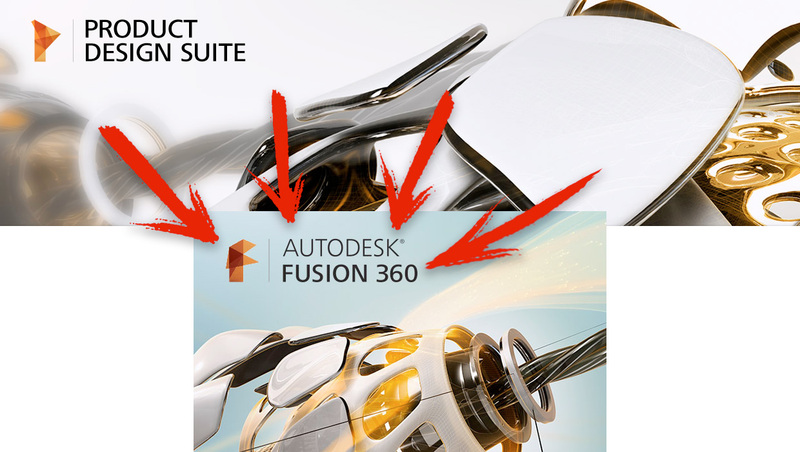 Why is Autodesk providing Fusion 360 as an entitlement to Product Design Suite for subscribers? Product Design Suite will continue to deliver on the promise of providing access to the latest MCAD technology in a comprehensive portfolio. We believe that Product Design Suite is great tool that help our customers design and make great products, but we want our Subscription customers to have access to tools that solve a new and different business and technical challenges. So we’re giving Subscription customers access to our new cloud-based product development tools. This entitlement brings more options and flexibility than ever before. Does this mean a shift in strategy away from Inventor and desktop suites? No. Our goal is to give our Subscription customers access to the best product development tools now and in the future. We know that all of our customers have different needs, and that those needs often change depending on the projects being working on. We will continue to increase software development in both Autodesk Inventor and Fusion 360 to bring our customers the new features and functionally they need to make great products. Why is this announcement good for Autodesk customers? Making great products is about having access to the right tools, at the right time and for the right users. Now you don’t have to choose. Product Design Suite provides access to the latest engineering and design solutions on one suite of tools. Fusion 360 allows you to explore more ideas, work together in a collaborative cloud-based design, engineering and fabrication environment with access to your data anytime from any device. With Product Design Suite and Fusion 360 you have access to best desktop and cloud based tools to transform your product development process. How do I get access to Fusion 360? Specific details on the entitlement of Fusion 360 for Product Design Suite subscribers are currently being finalized. Until then, customers can try Fusion 360 now free for 30 days. Considering how incredible the combined tool set is already in Fusion 360 and certainly will be in Fusion 360 Ultimate over the next 6 to 12 months, the inclusion of Fusion 360 to the Product Design Suite is pretty epic! It certainly harks back to a few years back when PrDS users could include Inventor Fusion within their Digital Prototyping workflows. It just Fusion 360 is far superior in most ways, I actually enjoy using it, contrary to Inventor Fusion which I truly despised. No doubt this will please a lot of customers… if not right now, it certainly will once they start using it. So how about those Inventor <> Inventor Fusion workflows so many product development and simulation users loved and ultimately lost? Will they make a return? There was no mention during Kevin Schneider’s road map post, so maybe not. But wouldn’t it be awesome if you could associatively import Inventor geometry into Fusion 360 or use Fusion 360 to flesh out a design in a natural direct editing environment, then push it back into Inventor to do some gnarly CAE? Honestly I would be surprised if Fusion 360 started to support associative import of Inventor models… since it would effectively kill Inventor HSM sales within Product Design Suite Ultimate sites. So I should probably now address the question in the title of this post. Based on previous conversations with various Autodesk staff and the FAQ shown above, the answer is clearly no… but let’s be realistic. That is the correct answer in the here & now, as well as into the next few years for sure. To back that statement up, John is going to share some thoughts over the next couple of weeks, detailing why we believe Fusion 360 has a long way to go before it can puff its chest in front of Inventor. But here’s the thing, by putting the Fusion 360 toolset in front of all of Autodesk’s Product Design Suite customers, they are dramatically increasing feedback potential from, and exposure to, a ‘professional’ user base. Personally I think that is the next step for Fusion 360, it’s a great tool considering its age, largely used by ‘makers’ and new innovative, fresh minded CAD users. However, we are approaching the point in Fusion 360’s life where it needs to stand up to more experienced scrutiny without abandoning the requirements of it’s original user base, after all it’s been success so far for good reason. Without covering a broader user type demographic, Fusion 360 risks alienating itself from a lucrative market and making Autodesk’s transition to Software As A Service more painful. Autodesk can’t just take away the red wine because they want you to drink the white. For now, they have to give you both and make the white wine irresistible. What do you guys think? Are you excited, angry or dubious? Please let us know in the comments below.